Ireland is one of the most popular themes for online slots. 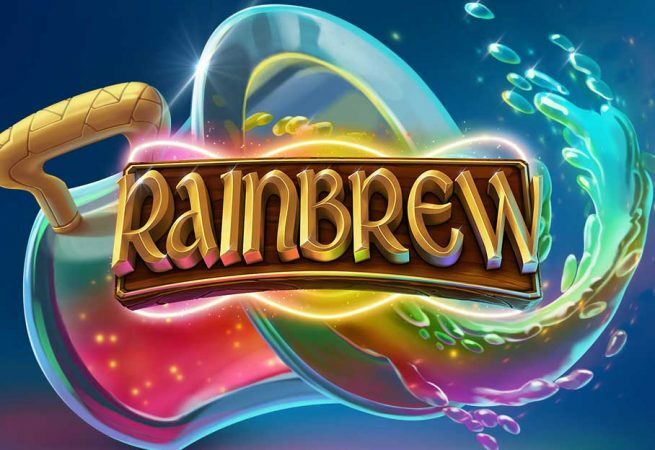 The Emerald Isle is associated with a number of things such as rainbows, pints of stout, leprechauns, pots of gold, and good luck, and all of these are brought to the reels in Microgaming’s latest release, Rainbrew Slots. 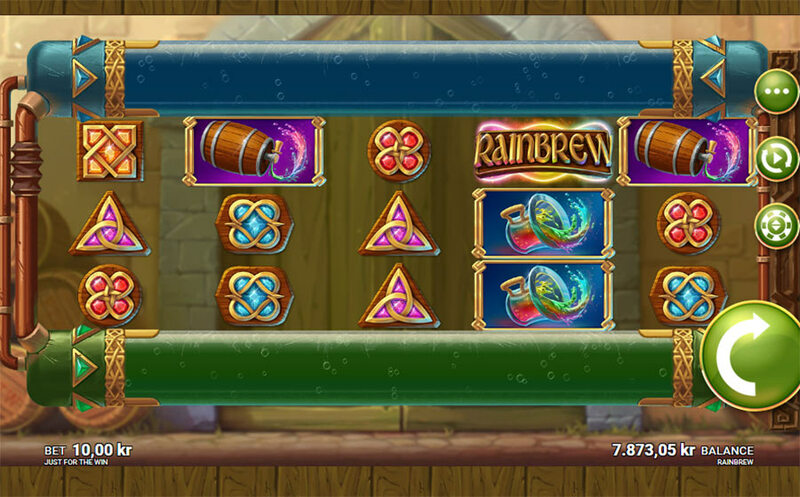 Rainbrew is a 5 reel slot with 3 rows and 243 ways to win. Thanks to this, all you need to do is land matching symbols from left to right along the reels to win a payout. The reels are set inside some kind of brewing machine, with a blue tube on the top and a green one on the bottom. There are five high value symbols, male and female leprechauns, a barrel of beer, a cup of beer, and a pipe. The lower value symbols are five Celtic designs in red, purple, orange, blue, and green. The slot has three types of wild symbols, Regular, Top and Bottom. They can all substitute for all of the other symbols, except the bonus symbol, to help and form winning combinations. The Top Wild can land on the second reel and the Bottom Wild can land on the fourth. When the Top Wild lands on the second reel the top tube will active and add an extra row to the reels where more wild symbols can land. The Bottom Wild activates the bottom tube in the same way when it lands on the fourth reel. If both wilds land simultaneously it means that there will be 1125 ways to win. The bonus symbol is the game’s logo. When it lands on reels two and four simultaneously then both the top and bottom tubes are activated. If you land three bonus symbols you win six free spins and if you land four then you win ten free spins. During the free spins the top and bottom tubes are active and only wild symbols and Free Spins symbols can land in them. If wild symbols stop on the same position on both tubes then the entire reel in-between them is filled with wilds. Each time that a Free Spin symbol lands you will win one extra free spin. Rainbrew has a betting range of £0.10 up to £100 per spin so it doesn’t cost very much to play. The symbols offer payouts of multiples of the entire bet per spin, rather than the payline bet. The top payout of 8x is offered by the male leprechaun, the female leprechaun can payout up to 7x, the barrel up to 6x, the cup up to 5x, the pipe up to 4x, and all five Celtic designs can payout up to 2x. This highly creative slot is full of exciting action. Give it a spin today and you are sure to have a fantastic time. If you have always wanted to travel to the Far East to learn a martial art then the new slot Hanzo’s Dojo from Yggdrasil Gaming is the game for you. It will immerse you in the world of martial arts, while giving you the chance to enjoy fantastic bonus features. Hanzo’s Dojo is a 5 reel slot with 3 rows and 25 fixed paylines. The reels are set on the side of a traditional Chinese building decorated with paper lanterns and cherry blossom. There are four high value symbols, they are four characters, a sumo wrestler, a man in blue armour, a woman, and a ninja. The lower value symbols are four designs coloured red, blue, purple and green. There is a golden mask wild symbol, it can substitute for all of the other symbols, except for the Free Spins and Hanzo Spins bonus symbols, to help and form winning combinations. Hanzo– If there are three in view it awards three Hanzo Spins in which a 3×3 symbol is locked into reels two, three and four. Free Spins– With at least one in view you will win the total number of free spins on the symbols together with extra boosters. For the free spins you will get one booster per Free Spins symbol that lands. The boosters are two extra free spins, paylines working in both directions, a 3×3 symbol nudge to get it into the best position, a 2x multiplier, or an entirely wild fifth reel. If you land three Free Spins symbols anywhere in view, including on the rooftop, then you receive the total number of free spins shown on those symbols and a booster if there are any symbols on the rooftop. 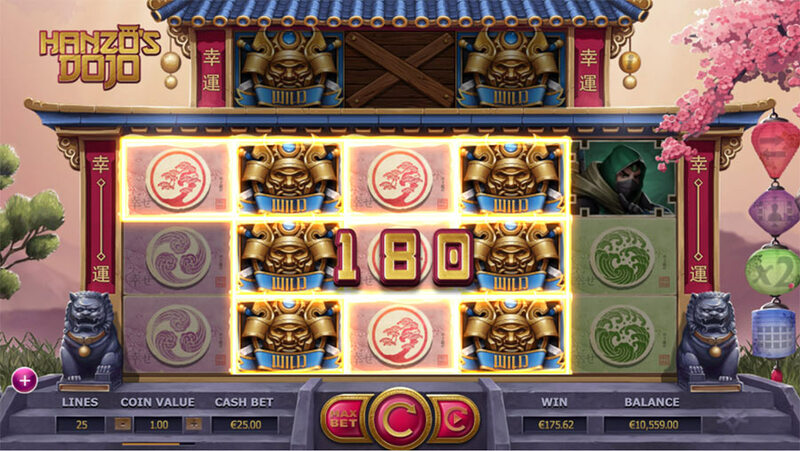 During the free spins the second, third and fourth reels only feature the giant 3×3 symbols. Hanzo’s Dojo has a betting range of £0.10 up to £125 per spin, so it is suitable for most sizes of bankroll. The sumo wrestler offers the top payout of 235x when five land along a payline. The man in blue armour can payout up to 200x, the woman can payout up to 180x, and the ninja can payout up to 165x. The red symbol can payout up to 60x, the blue symbol up to 50x, the purple symbol up to 40x, and green symbol up to 30x. Like all of Yggdrasil Gaming’s slots, this is a beautifully designed game and its many features ensure that there is always action taking place. Whether you are interested in martial arts or not, you are sure to have a great time playing so give it a spin today and see what treasures you can win. It seems that it has been a week of new Irish slots and the second one to feature is from Pragmatic Play. It is called Leprechaun Song and it will take you on a musical adventure with the chance of winning some great riches. Leprechaun Song is a 5 reel slot with 3 rows and 20 fixed paylines. The reels are set in a wooden frame decorated with four-leaf clover, while in the background you can see a rainbow over the green hills of Ireland. The high value symbols include the leprechaun, his hat, his pipe, and a pint of stout. The lower value symbols are the playing cards 10, J, Q, K and A. The rainbow is the wild symbol, it can substitute for all of the other symbols, except for the scatter symbol, to help and form winning combinations. The scatter symbol is the pot of gold. If you can land the scatter symbol on reels one, three and five simultaneously then one of three bonus features is chosen for you at random. If you have landed scatters on reels one and five then the third reel may be nudged to help you trigger the feature. Free Spins – Choose from the mushrooms to win free spins with multipliers. You can keep picking until you find ‘collect’ at which point the spins begin. During the spins an extra random wild symbol will also be assigned. Coin Collector – You win fifteen free spins with a 2x multiplier. During the spins you need to collect the gold coins and every five that you collect will award five extra spins and increase the multiplier by 1x. Giant Symbols – You win three free spins with a giant 3×3 symbol on the reels in various places. While playing there are also three random features that can be awarded in the base game. The Raining Wilds feature adds extra wilds to the reels as they spin. The Pick A Fiddle feature is a picking game in which you need to choose from five fiddles for a cash prize. The Giant Symbol bonus adds a 3×3 symbol to the reels. Leprechaun Song has a betting range of £0.20 up to £100 per spin so everyone can enjoy it. The wild symbol offers the top payout of 800x. The leprechaun can payout up to 400x, the hat up to 300x, the pipe up to 250x, and the stout up to 220x. The A and K can both payout up to 200x, while the Q, J and 10 can all payout up to 100x. 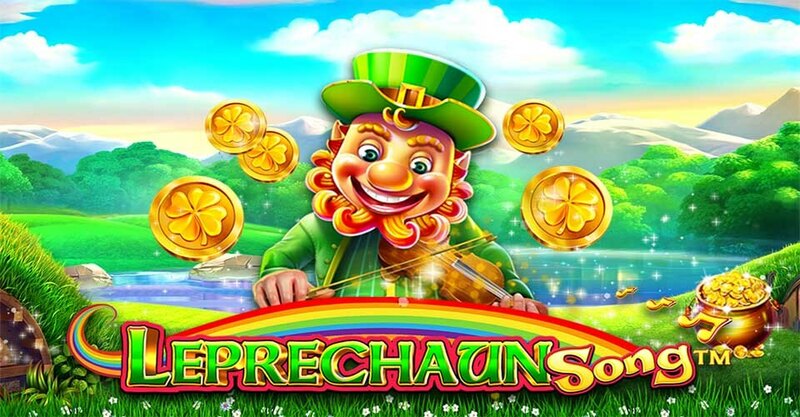 If you are looking for a cheerful slot that is packed with some fantastic features and the chance of huge payouts then give Leprechaun Song a spin today.